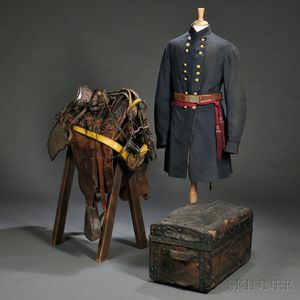 Frock Coats, Saddle, and Trunk of Col. Thomas F. Gallagher, America, c. 1861-65, double-breasted blue broadcloth officer's frock coat with buttons set in threes with sash and sword belt, double-breasted frock coat with buttons singled with sash and sword belt, officer's saddle with yellow painted martingale, bridle, reins, and valise, also includes his trunk, a lithograph of Col. Gallagher, as well as a memorial to G company of the 11th Pennsylvania Reserves. Note: Thomas Foster Gallagher enlisted July 21st, 1861 as Colonel of the 11th PA. Reserves, listed as a POW June 27th, 1862 at Gaines Mill, Virginia, exchanged August 15th, 1862, wounded in action at the battle of Frostburg Gap, South Mountain during the Antietam campaign as brigade commander, Brevet Brigadier General March 13th, 1865. Double-breasted coat with buttons in three's has a hole in the center back, and is missing part of the lining as well as moth tracks, coat with singled buttons has many holes and needs restoration work, saddle and leather need cleaning, one stirrup strap is broken. Trunk has some leather loss also.